Briya’s workforce development programs provide college and career readiness training in the early childhood and medical fields. 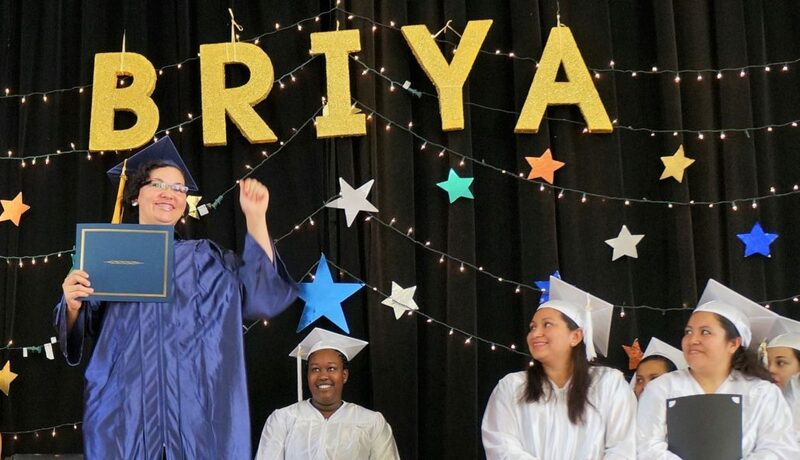 Many students enter these programs after advancing through the levels of Briya’s Two-Generation Program, while for others workforce development is their first experience at Briya. Through these two certification programs, along with the opportunity to earn a high school diploma, Briya sets families on career pathways to economic independence and stability. Students graduate from Briya’s 12-15 month program prepared for careers as Registered Medical Assistants, who work alongside doctors and nurses in medical offices, clinics and hospitals. Throughout Briya’s course, students gain hands-on practice with clinical lab skills such as drawing blood, giving injections and taking blood pressure. They also gain proficiency in administrative skills, including updating patient records and coding insurance forms. Briya offers the Medical Assistant Program in collaboration with our longtime partner, Mary’s Center, thereby providing students embedded learning opportunities with Mary’s Center nursing and medical assistant staff. Students also complete a 160-hour externship in a local clinic, hospital or doctor’s office. The course concludes with summer test-prep sessions that equip students to pass the nationally recognized Registered Medical Assistant exam. To qualify, students must be DC residents, have a high school diploma or equivalent, and display their proficiency in English reading and math by passing entrance exams. If interested, call 202-232-7777 or complete this form. Briya’s year-long Child Development Associate program equips students to provide high-quality care and education as early childhood teachers, home visitors or directors of licensed childcare homes or centers. Students begin by learning the foundational theories of child development, including indicators of healthy physical, cognitive, linguistic and social-emotional development. Students put these theories to practice by working with children in a licensed childcare center or school during the course’s 480-hour practicum. They also gain CPR/First Aid certification and create a professional portfolio. After completing course requirements, students are assessed by the Council for Professional Recognition to receive their national Child Development Associate credential. Classes are offered in English and Spanish. To qualify, students must be at least 18 years of age, be DC residents and display their proficiency in reading and writing by passing entrance exams.